Well, not really. It would not be funny if you were standing there, staring at your phone waiting to get a text for two minutes, much less ten. (You know you've done it.) But if it happened to a friend—now that would be funny. This is where the pranksters from Miscellaneous Mischief come into the picture. 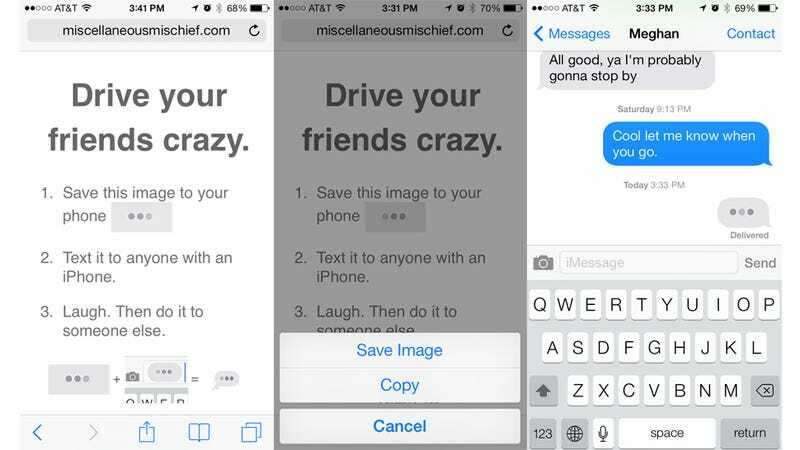 They've built a little single serve website called "Infinite Text-In-Progress" that helps you trick your iPhone-toting friends into thinking they're receiving a text. All it takes is a tiny animated gif that matches the text-in-progress symbol for the iPhone. Just open the page on your phone, tap the animated gif, hit save, and then send it to your friend as an picture text. (Alternatively, you can just copy the image from the page and paste it in a text.) She'll think you're about to send her a text, but alas, you're not. There is an obvious caveat here: the little "Delivered" line shows up under the text. If you have smart friends, they'll realize that it's a little weird to see "Delivered" below the text-in-progress symbol. (Update: As benchslap astutely points out in the comments, the recipient won't see the "Delivered" message so forget I said anything.) They might also think it's weird to get a new text alert when it's just you typing. Then again, everybody's so confused by iOS 7, they might just think it's a new feature. Now, off you go! Cause trouble!